Given the huge number of iPod docking stations on the market, you better have some special features to win a spot on Gizmodo's mantle (and justify a $499 pricetag). This MacWorld Best of Show winner, which is in no way connected with Vandelay Industries but made by Chestnut Hill Sound, certainly stands out. Along with a bandless AM/FM tuner and a multi-featured alarm system, it is architected for future upgrades via a USB port and packs a bass volume knob in the back. 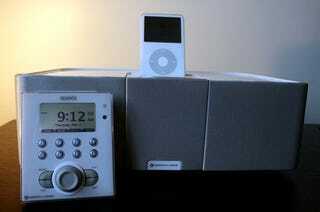 The real draw, though, is the removable remote control, which enhances the functionality of your iPod in several ways. Take a tour of the GEORGE, and find out whether it's worth the asking price, in this photo gallery.